At Morman Family Chiropractic, we provide more than just adjustments – we provide hope. Since 2012, we’ve always made family wellness the focus of our chiropractic care center. Morman Family Chiropractic is passionate about working with Ottawa community members of every age, from newborns, babies and children, to moms, dads and grandparents. We have a reputation for excellence in delivering gentle adjustments that help our patients get control of their symptoms quickly and efficiently. We provide experienced pediatric chiropractic care and are known as a destination spot in northwestern Ohio for families seeking help for their children. Our philosophy is simple: just get checked. The rooms of our clinic echo with those three words and its meaning is profound. The nervous system is incredibly important to your quality of life, and a well-functioning one can make the difference between vibrancy and vitality or sluggishness and mediocre health. This belief is true whether you’re 89 or 4 months old. Most of us cannot know with certainty how well our nervous systems are doing. We cannot know because symptoms only come along once a breakdown has been well established. We’ve been able to bridge that gap with the addition of the Insight Millenium Subluxation Station™ to our evaluation protocols. This painless and noninvasive scan technology can tell you within minutes where you are in the optimal function range. This advanced technology not only assesses the level of your nervous system health but also gives us the precise areas to treat with laser-like accuracy. 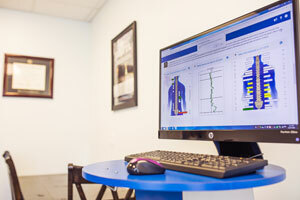 The diagnostic scanning technology that we use in our practice makes the source of your problem crystal-clear. Through our state-of-the-art analysis, we’re able to establish your health baseline and develop a game plan that’s customized to your unique needs. Our cutting-edge testing procedures are one of the reasons we experience such successful outcomes with our patients. Another way our office stands out is the people working in it. From doctor to staff, we take the time to listen, and we take your concerns and challenges seriously. We’ll go the extra mile for you and will always make sure that you feel the depth of our caring. The experienced care at our chiropractic office is supportive and patient-centered. Your well-being is our primary focus. We offer affordable payment plans and accept Care Credit. Contact our chiropractic office today for a weekday or Saturday appointment!